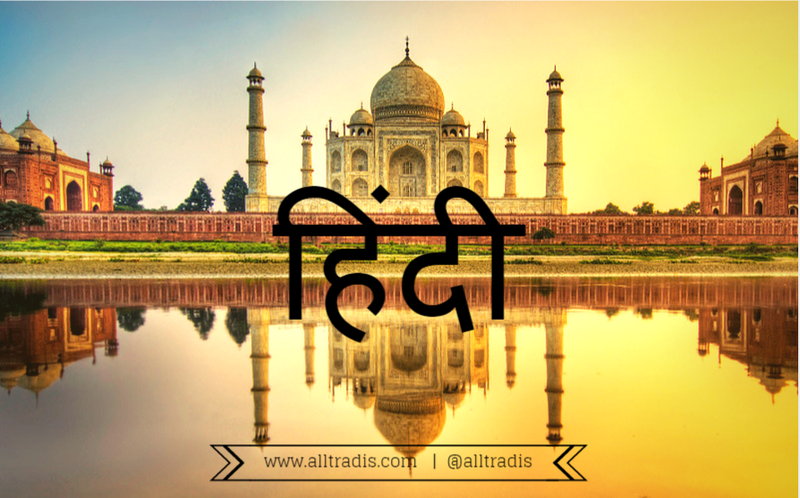 Language of this Week : Hindi ! First, a little background information. Hindi comes from the Persian word Hind which means « Land of the Indus River » and has roots going back to nearly 5,000 BC. It became the official language of India in 1965, but is also spoken in other countries such as Mauritius; Fiji and Nepal. It is also one of the most spoken languages in the world, close to 425 million people speak Hindi as their first language. Like in French, in Hindi, all nouns have genders and the spelling of verbs and adjectives change to agree with the noun. If your new years resolution this year was to learn Hindi, then you might have just lucked out. It is said that Hindi is to be one of the easiest languages to learn due to the fact that it is read exactly has it is written. But then again, it also has 48 officially accepted dialects. Santa: I was hit by a bus when I was a child, you know. Banta: Oh my god, did you die or survive? Santa: I don’t remember, I was only four then. संताःपता है बचपन में मुझे एक बस ने धक्का मार दिया था. बंताःबाप रे, तू मर गया कि बचा? संताःयादनहीं, मैं तब केवल चार साल का था. [Santa: Patahai, bachpan mein mujhe ek bus ne dhakka maar diya tha. Banta: Baap re, tu mar gaya kibacha? Santa: Yaad nahi. main tab chaar saal ka tha. Santa: How much is a banana? Santa: Would you sell it for 60 paise? Grocer: You could only get the skin of the fruit for that price. Santa: Take 40 paise, just give me the banana, (and keep the skin). संताः 60 पैसे में दोगे? फलवालाःइतने में तो बस छिलका मिलेगा. संताःये लो 40 पैसे, मुझे बस केला चाहिए. Santa: 60 paise mein doge? Falwala: Itne me to sirf kele kaa chhilkaa milegaa. Teacher: Write an essay on a cricket match. All pupils started writing except one. Teacher: Why are you sitting? Student: I’ve finished the essay. Teacher: What did you write? टीचरः क्रिकेट मैच पर लेख लिखो. सब लिख रहे थे. मगर एक छात्र बैठा था. छात्रः बारिश हो गई, मैच रद्द. [Teacher: Cricket match par lekh likho. Hope you had a good laugh!